The number of British Islamists who have gone to Syria to fight in the war there is in the "low hundreds", a senior UK intelligence official says. Andrew Parker, head of domestic intelligence service MI5, told a parliamentary hearing the conflict was attracting al-Qaeda UK sympathisers. Their interaction with militant groups abroad was a "very important strand of the threat" the UK faced, he said. One in 10 foreign militants in Syria is believed to be from Europe. Most of them come from Saudi Arabia, Tunisia and Libya. MI5 has previously said that up to 200 British fighters are in Syria. Last month, BBC News learnt that a group of 20 young men from the UK were fighting against forces allied to Syrian President Bashar al-Assad on the Turkish border. According to the Centre for the Study of Radicalisation at King's College London, most British jihadists are in their 20s, university-educated and Muslims of British Pakistani origin. Up to 20 people from Britain's Sudanese community and several ethnic Syrians from the UK have also gone to fight in Syria. More than 100,000 people have been killed and about two million people have fled abroad since the uprising against Mr Assad began more than two years ago. Syrian troops have retaken the rebel-held town of Sbeineh south of Damascus, state media and activists said on Thursday. The town was regarded as one of the most important rebel positions near the Syrian capital. Elsewhere, international inspectors said they had verified one of Syria's two remaining chemical weapons production sites, using sealed camera footage to conclude that it had been dismantled and abandoned. "Syria has become a very attractive place for people to go for that reason - those who support or sympathise with the al-Qaeda ideological message," Mr Parker told the Intelligence and Security Committee in London. "We've seen low hundreds of people from this country go to Syria for periods and come back - some large numbers are still there - and get involved in fighting. "This is partly because of the proximity of Syria and the ease of travel there, but also because it is attractive as what they would see as a jihadi cause." The MI5 chief noted that British suicide bombers who attacked London's transport system on 7 July 2005 had made contact with Islamist militants abroad. "It is a very important strand of the threat we face, the way in which there is interaction between people who live in this country who sympathise with or support the al-Qaeda ideology and then travel to areas where they meet these al-Qaeda groupings, either al-Qaeda itself in South Asia or some of these other groupings across other regions. "The attractiveness to these groupings is that they meet British citizens who are willing to engage in terrorism and they task them to do so back at home, where they have higher impact, in this country. We've seen that played out in previous plots here, including 7/7." 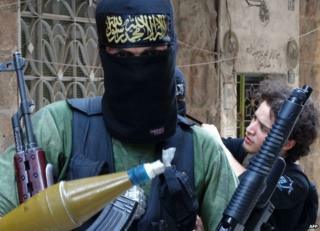 There are believed to be as many as 1,000 armed opposition groups in Syria, commanding an estimated 100,000 fighters. Diplomats are still struggling to fix a date for a long-delayed peace conference on the Syrian conflict. The UN-Arab League envoy on Syria, Lakhdar Brahimi, said he was "striving" for a summit by the end of the year.